There's been a request for more pictures of Finley on the blog... but we'll start with one of Braden. He's getting pretty cozy in the Bumbo--or bum-bum as Finley calls it. 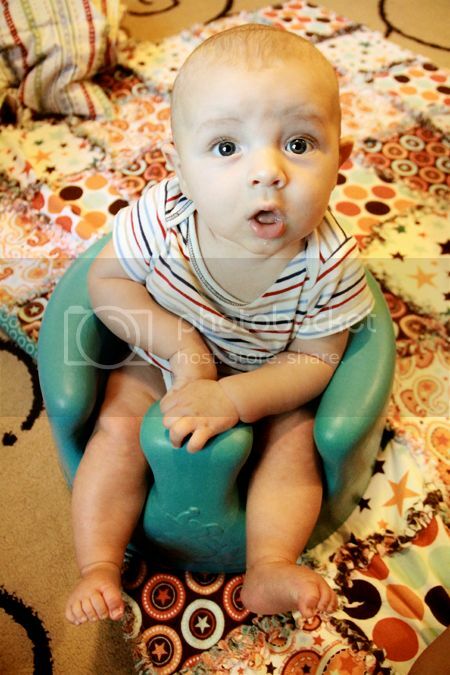 Finley likes to sit in the Bumbo too--and he likes to tell me to sit in it and then say, "TOO BIG." Thank Finn. I know my booty is too big, I'm working on it. Kind of. Finley's favorite seat is this very awesome bean bag I made him! I may do a post on it in the future because I'm beyond proud of my sewing skills on this one. I sewed CURVED LINES, friends. Finley didn't want to look at the camera because I was letting him watch Word World, which he is ob-sessed with. Sometimes when I ask Finley what he wants to do he says, "hang out." So those are my boys--just hangin' out. Sooo impressed with the bean bags!! Oh, and what is word world? I feel like I should probably buy it! I TOTALLY COMMENTED ON THIS EARLIER. The internet deleted it. And you went to popped out comments? Weird. Hanging out with such great company on an August summer's day...hope you've got a Popsicle for the Finn and a Pinkberry for yourself. Braden looks like he is totally enjoying himself.